To have an appetiser for their new and fourth CD, the Danish thrash metal band Hatesphere has released a four track EP that was produced by Tommy Hansen. So far I haven't been very familiar with Hatesphere and my first impression really wasn't too overwhelming. The opener Murderous Intent is a solid song where classic thrash metal riffs get confronted with nu metal brutality. Quite ok, but the song sometimes lacks a bit of speed. The following You're The Enemy is much faster and brutal and free from all modern trends. This is a pure retro thrasher. The Will Of God is the most aggressive song on the EP and it underlines that Hatesphere are at their best when they give full speed and play close to their limits. The EP ends with a disappointing cover version of Trip At The Brain (Suicidal Tendencies), miles away from the charm of the original. 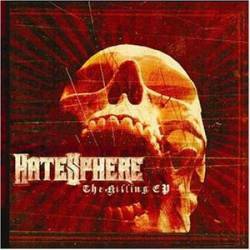 Hatesphere are a thrash metal band with some talent, but there's still a lot of work to do, especially concerning originality.